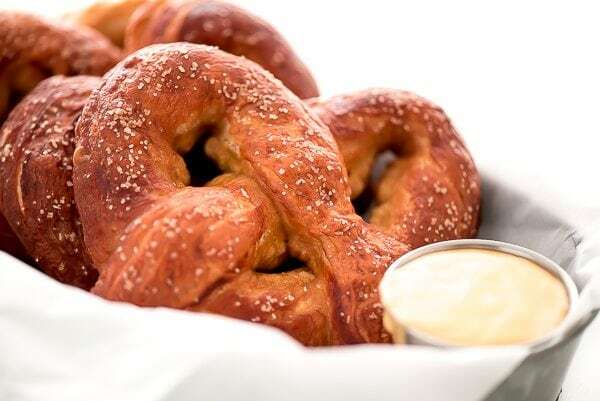 Bust out the bag of flour and enjoy your favorite ballgame snack at home with these soft, chewy, and salty Soft Pretzels. I grew up in St. Louis, home of the Cardinals. Going to a baseball game at Busch Stadium each summer is a must! While it may be 98 degrees with 100 percent humidity, there’s nothing quite like cheering for your home team with thousands of people. And the best part? The fireworks when they strike a home run and the food! Can you even go to a baseball game without getting a giant soft pretzel? 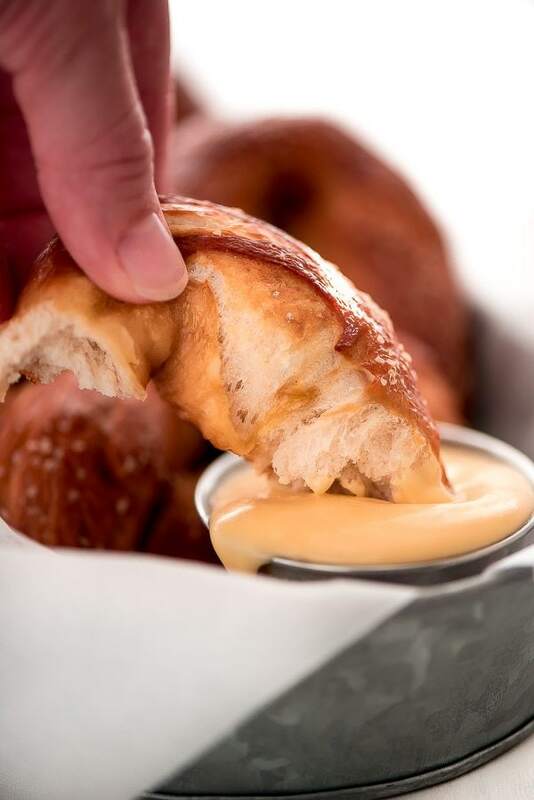 Well, if you can’t make it to a baseball game, you can at least still enjoy a warm soft pretzel. Making pretzels is so much fun! There’s just something about cooking with yeast that is magical, hello cinnamon rolls! And rolling out soft squishy dough is as much fun as playing with play dough. In fact, I cut off a few pieces for my 2 and 4 year old to play with (and distract them) while I shaped the pretzels. They of course made a huge mess but seeing them so happy and having fun is more than worth the clean up. 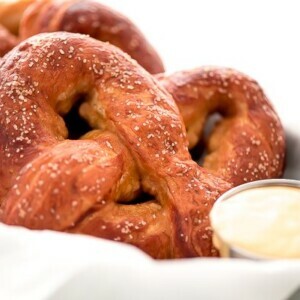 Like any yeast dough you start these soft pretzels by activating the yeast in water with a bit of sugar. 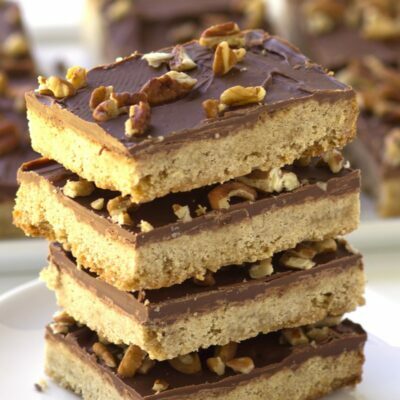 I added a little more than typical and used brown sugar to give it a little more depth. Then you mix in the flour and a bit of melted butter and knead the dough. I highly recommend getting a dough hook for you electric mixer if you don’t already have one as it saves you lots of time and energy. Plus, you can get a few dishes clean or break up a fight between your kids while the machine is doing all the work. After kneading, cover the dough with a towel and let it rise. Then you roll out the dough and form into a pretzel. This next part is what makes pretzels, well, pretzels! 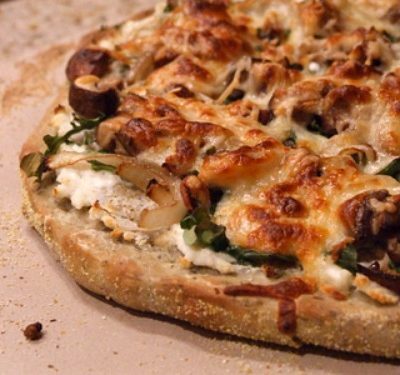 You take your shaped dough and drop it into a pot of boiling water with baking soda for just 30 seconds. 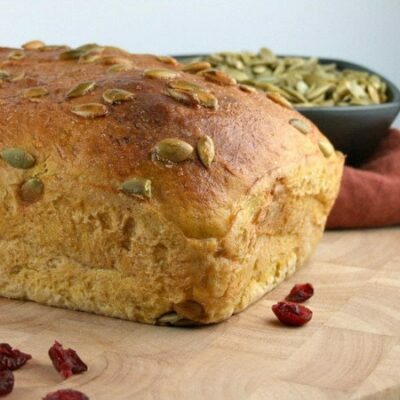 Boiling the dough in this alkaline solution is what helps the bread develop that deep dark crust and gives it that signature flavor. 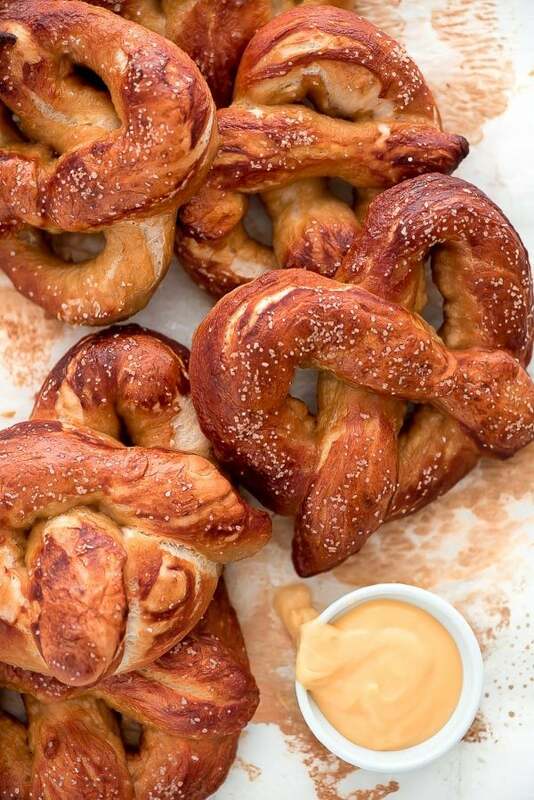 I have no doubt you and your family with love these salty, chewy pretzels. Enjoy! Place water, brown sugar, salt, and yeast together in a bowl of a stand mixer fitted with a hook attachment. Let it sit for 5 minutes or until it begins to foam. Add the flour and butter and mix on low speed until combined. Turn up speed and beat on medium for about 5 minutes or until dough pulls off the sides. And is no longer sticky. Remove dough from bowl, grease bowl lightly with oil, and place dough back in the bowl and cover with a tea towel. Let rise for 50 to 60 minutes or until double in bulk. Preheat oven to 450 degrees F. Bring 10 cups of water in a large pot to a boil. Line 2 baking sheets with parchment paper and lightly grease. Lightly flour working surface. Divide dough into 8 pieces and roll each into 24 inch ropes and then shape into pretzels. Place on parchment lined pan. Add the baking soda to the boiling water and cook each pretzel on at a time in the boiling water for 30 seconds. 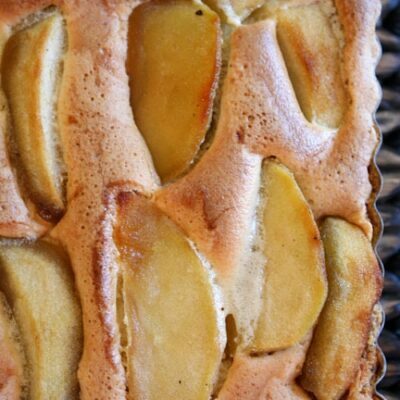 Remove with a slotted spatula and place back on the baking pan. Mix the egg yolk and water together in a small dish and brush over the top of pretzels. Sprinkle with coarse salt and then bake (one pan at a time) for 13 to 15 minutes until dark golden brown. Remove from oven and let cool on a rack for 5 minutes before serving. Yum! 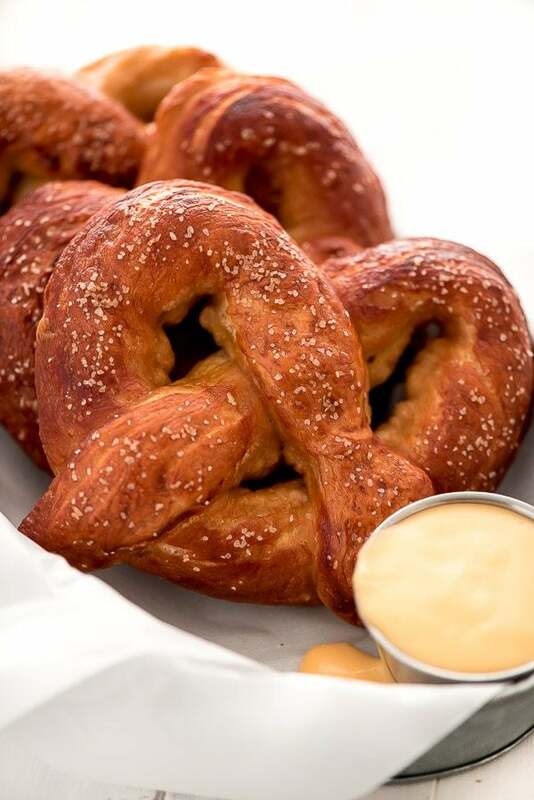 There’s nothing better than a soft-pretzel, especially a freshly-made one! I didn’t even realize how easy it was to make them at home. I’ll definitely be trying out this recipe soon!